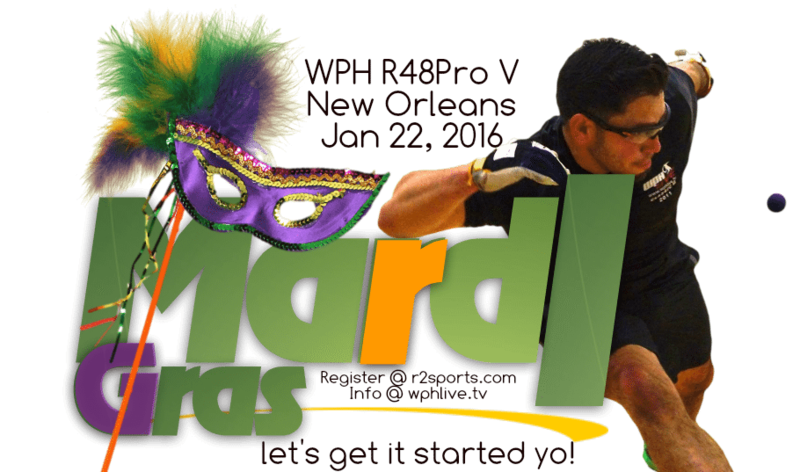 The World Players of Handball returns to The Big Easy! The WPH is outside the hurricane season for this upcoming Race4Eight Stop (Jan 22-24, 2016) and the nearest volcano is some 2,000 north american miles away. “The only damage happening this particular weekend will be broken balls and Bourbon Street VIP parties in the French Quarter,” claims Vincent. WPH film crews will be on hand to capture the action; meanwhile, locals will watch the best handball players on the planet with Paul Brady, Luis Moreno, Emmett Peixoto, and Sean Lenning, to name just a few, expected. WPH will name eight Elite players and qualify eight more. The pro qualifier will begin at 9am on Friday, with a bracket capped at 32 and anyone can enter. Pro elite main court matches begin at 2pm. For more pro information, please contact the WPH: wph@race4eight.com. Note: There will be a regular tournament alongside the pros and you can enter.